The 8×8 Art Auction and Gala is an inspiring evening of art, music, wine, and food that brings the community together in the Gallery setting of The Crossing Arts Alliance, which has a big city feel right in our downtown. Join us Thursday, October 4th from 5 to 7 for a wine tasting by CashWise Liquor, beer sampling from Roundhouse Brewery, heavy hors d’ oeuvres, and some competitive bidding for a good cause. 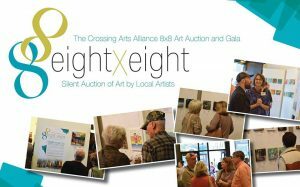 Dozens of area artists contribute artwork on 8” x 8” canvases, which are offered in a silent auction at the event. All proceeds from the evening go to benefit The Crossing Arts Alliance as we work to provide more arts programming to our community. ARTISTS – WE NEED YOUR HELP! Would you contribute art to our 8×8 Art Auction? We provide the canvas, so stop by to pick one up, add your creative talents, and return it to us by September 27 and your admission to the gala is only $10. Our gratitude for you knows no limits.